Nearby alpine gems inspire locals and visitors alike. An endless coastline, mild climate, and constant ocean breeze are all part of life on Vancouver Island. Most visitors come to Canada’s lush West Coast isle to stroll the beaches, play in the surf, and get a taste of Island time. But Vancouver Island hides a wild secret far away from its sandy shores. 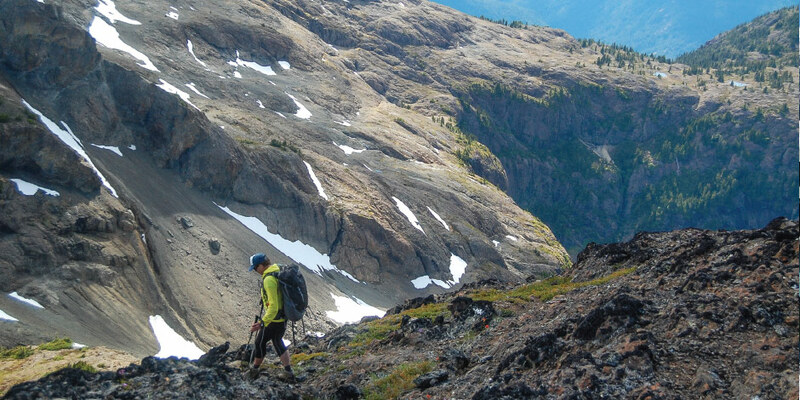 There are more than roughly 450 mountains standing over 1000m high, running down the rocky spine of Vancouver Island. Spanning over 31,788 sq kms, the Vancouver Island mountains include many sub-ranges situated from Sooke all the way to Cape Commerell. Throughout the length and width of the island, clusters of majestic peaks lunge upward from sea to alpine in a shocking pitch of relief. Many of these mountains have yet to be climbed, a few of the peaks still remain unnamed, and most of the summits you will never see. But all of them possess a unique Van Isle voodoo. Lindsay Elms knows all about the spell of these mountains. After exploring mountain ranges on all seven continents, Elms landed in the heart of Vancouver Island and quickly found himself captivated by its enchanting ranges. He started climbing island peaks in the summer of 1989, while working as a guide and instructor out of Strathcona Park Lodge, and hasn’t had the urge to stop since. A self-proclaimed peak-bagger, Elms quickly knocked off most of the Rick Eppler Vancouver Island qualifier peaks over 1800m, before turning his focus to the more obscure and lesser known mountains of the north island. The author of two books, including Beyond Nootka—a comprehensive history of the mountain regions of Vancouver Island—Lindsay also has a passion for the wild history of the island. In recent years Elms’ fascination with these ranges has morphed into a personal mission to find, document, and summit every last peak over 1000m. And he is nearly there. Just last summer, Elms researched, accessed, bush-whacked, trekked, climbed, and bagged 15 unnamed peaks. Such mountains are not only difficult to access, but their route beta remains a mystery until they are directly underfoot, which significantly ups the adventure ante. Herein lies the fascination for Elms. Stepping into the unknown, new territory, and touching pieces of the earth where few, if any, have ever been, is not only exciting to Elms but a necessity to sustain his identity as an explorer. Of course, he isn’t alone. In a busy world of high-tech, fast paced, must-do but no time to-do, humans are more plugged in than ever. But we have managed to connect ourselves to all the wrong circuits. Overbooked schedules and lives deep inside the grid choke us off from some of our most basic human needs: adventure, wonder, and exploration. Humans are born to explore the world around them. Watch an infant for a few moments and you’ll see a primal desire to reach out and touch, taste, smell, and hold every single thing in their small world. Adventure is a human necessity. It’s in our cells, in our blood, and in our hearts. It’s where we came from, how we got here, and how we will connect to the world ahead. It’s why we have survived. We are all born explorers. Wild spaces provide us with boundless adventures where we can play hide-and-seek and satisfy our need to know what’s around the bend. There is a growing resurgence of our sense of adventure and a fresh fascination with all things wild. More than ever, it seems people are grabbing their cameras, packing their backpacks and trekking off into the wilderness to immerse themselves in nature’s charm. Just swipe through your social media channels and you will likely see more than a few of the classic #stareintothewild photos in your feeds. The same technology that once cut us off from the supernatural world is now fuelling a growing desire for humans to reconnect with nature. There’s a frenzy of supernatural selfies on Instagram. The PNW (Pacific Northwest) vibe, rules. Suddenly, it’s cool to be outdoorsy. The explosion of social media platforms has allowed us to instantly log, upload, share, like, and crowdsource our next adventure at the click of a button. There are mixed feelings about the increased use of wilderness on Vancouver Island and elsewhere. With increased traffic, comes the risk of ignorance and arrogance leaving dark marks on the trails. The flip side, however, is the beautiful potential for more people to fall hard for the charm of nature and (hopefully) to champion for her wild spaces. Day-trippers, over-nighters, big wall die-hards, multi-pitch climbers, multi-day backpackers, light weight fast-packers, and ultra-running peak-baggers are all drawn in deep by the lure of Vancouver Island’s untamed wilderness. The most accessible mountains are obviously also the most popular, but even so, you would be hard pressed to encounter more people than squirrels on any given day. Vancouver Island has many approachable peaks that provide a progressive introduction to the school of wilderness culture. The south island has the Kludahk trail and Mount Arrowsmith. The north island has the rugged Prince of Wales range, including the ever popular Mount H’Kusam. Make no mistake, these are real mountains, with real risks and rewards. A parking lot and a sign at the trailhead doesn’t mean you will be waltzing into a Whistler-esque contrived wilderness just a cell phone call away from your next latte. Adventure awaits, but so does the harsh reality of real wilderness for those who head out unprepared for the unforgiving back country. The Comox Valley is the gateway to the most majestic peaks on all of Vancouver Island. Strathcona Provincial Park is home to the “Island Alps” and can be accessed via Paradise Meadows at the base of Mount Washington Ski Resort, or from Buttle Lake to the west of Campbell River. 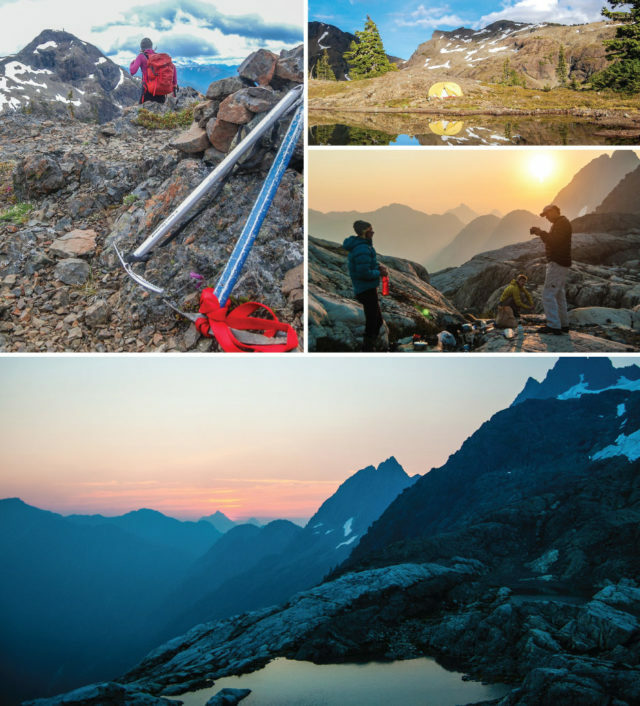 The tallest peaks on Vancouver Island lay unseen in the centre of Strathcona Park. If it weren’t for the postcard views of the Comox Glacier from 5th street in downtown Courtenay, most people would never realize that Vancouver Island has alpine, let alone entire mountain ranges. But they are there. The island’s most captivating peaks exist beyond the gates of private logging roads, out of view from the highway, and compared to the mainland, they are rarely seen, let alone summited. Vancouver Island’s mountains may be relatively small in stature, but their wicked relief and heavily forested approaches make for more than challenging climbs. Anyone who has ever attempted a summit knows how it goes. Quad-searing, shin-smacking, back-aching bush-whack approaches are a rite of passage en route to the alpine. These mountains climb dramatically upward from sea level to over 2000m without stopping for a breather. And once you break through the thick forest to reach the rock above, the supernatural beauty of this Island Alpine will dazzle you with its surprising terrain. Glaciers, ice caves, crevasses, big rock walls, technical multi-pitch climbs, and endless interconnected ridgelines all exist in near miniature, perfect scale. The steep and technical profile of the mountains, combined with a relative lack of access and consistently inconsistent weather, has helped to preserve a wild and remote energy on Vancouver Island, one that’s become muted in many of the more accessible parks around the province and the globe. Stepping off the grid and into the wild is quite literally a breath of fresh air. Our lungs expand, our shoulders relax, and we feel as if we can breathe for the very first time. The further we venture, the deeper we fall into the hypnotic rhythm of nature. There’s magic in the mountains. It’s in the unknown and the unexpected. It’s over the next bump and beyond the next ridgeline. It’s in the wind in your hair and the wild blueberry stains on your lips. And it’s in the mysterious way that wilderness helps us find ourselves and lose ourselves at the very same time.